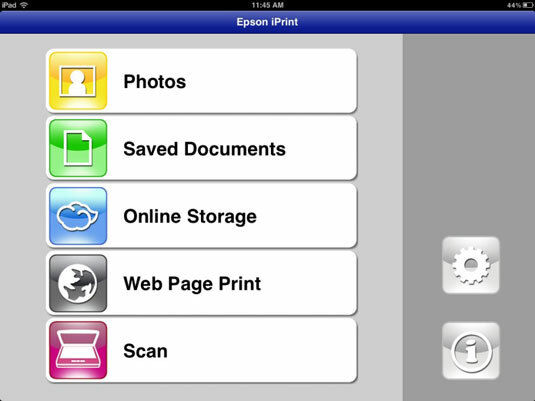 Printing directly from your iPad can be accomplished using Epson iPrint. Employ Epson iPrint to print documents in situations where an AirPrint-enabled printer is not available, and Printopia won’t work. You must have an Epson wireless printer to use Epson iPrint. If only everything in life could be perfect . . . but it isn’t. There are two potential problems for some users looking to purchase Printopia: It doesn’t work in Windows, and it shares printers with users on the same wireless network. Collobos Software offers a product called Fingerprint that’s close in functionality to Printopia and works on both Windows and Mac platforms. Remember that just as with Printopia, the software is installed on your computer, not your iPad. It will then share your physical and virtual printers so that they can be accessed from the Print function on any iOS device. You can arrange and print the photos on your iPad. Use the built-in web browser to print webpages. iPrint will print a variety of files, including Microsoft Word, Excel, and PowerPoint files, and PDF documents. Print stored files or e-mail attachments. iPrint allows you to connect to cloud services such as Google Docs, Dropbox, Box, and Evernote, and print files you have in your account. If you have an Epson multifunction printer, you can connect to the scan function and preview any document you’ve placed in the printer. Set the scan resolution, crop, and then scan the document. Save the scan to your iPad; then e-mail or print it. The entire interface is controlled wonderfully from your iPad without the need to use your laptop or desktop. Configure your print options, including paper size and type, number of copies, and one- or two-sided printing. Check your printer’s status and ink levels. iPrint does an annoying flaw: Everything has to be managed and printed from within the iPrint app itself. It isn’t a very convenient interface because you usually want to print something from within the app you’re using as you’re creating and editing it. Instead, you have to save your file somewhere that iPrint can get it and download it into the iPrint app, and only then can you print. Hewlett-Packard also offers its own app, called HP ePrint, that’s available through the App Store. ePrint will print to your HP printer over a Wi-Fi network or over the Internet.